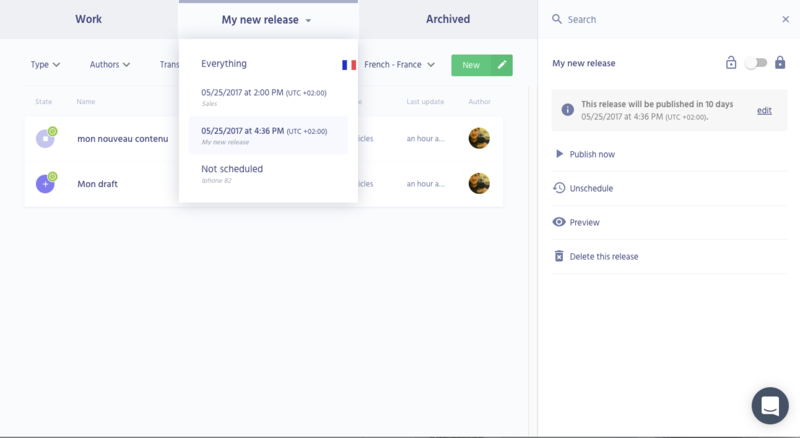 Once your release is ready, prismic.io offers the ability to schedule the release in order to publish all the changes automatically. You can use this to manage sales publications or events during the weekend or in the middle of the night without having to log into to prismic.io. You can schedule your release for a particular date & time. Select the release from the release dropdown and click on "Schedule" in the panel on the right. If the release has not already been scheduled, then a pop-up will appear and you can select the date and time. You can see at a glance if a release is already scheduled for publication. In the panel on the right, a notification will be displayed noting when the release will be published. It will also be noted in the release dropdown. When viewing a document in the release. The scheduled publication will appear on the top bar. Note that the date & time are based on your local timezone. Another editor in a different timezone will see a different date & time.